An engraving appended to the end of A breviate of the life, of VVilliam Laud Arch-Bishop of Canterbury: extracted (for the most part) verbatim, out of his owne diary, and other writings, under his owne hand. / Collected and published at the speciall instance of sundry honourable persons, as a necessary prologue to the history of his tryall, for which the criminal part of his life, is specially reserved by William Prynne of Lincolnes Inne, Esquier, published in 1644. The engraving is by Wenceslaus Hollar. 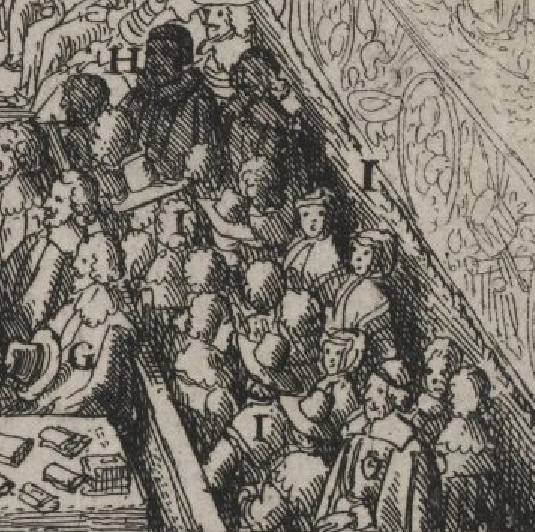 As ever though, the best part of these crowd engravings is the little details that come out when you zoom in. At the back of the hall, in the foreground an splendid selection of coats and cloaks, showing the reverse side that you don’t often get in portraits. One or two caps being worn too and a dog seems to have sneaked in on the left hand side. An annotated group here. A marks the Archbishop in his gown and a black day cap. Unusual not to see him in his bishop’s robes, the rocket with white sleeves would have stood out had he been wearing it. B is black rod, C the Lieutenant of the Tower, D the council for Laud and E the clark who reads the evidence, looking very pleased with himself in a short cloak and laced band. F is a table. A small group of women here against the tapestried wall on the right hand side. G is the area reserved for members of the Commons, H is Henry Burton who had had his ears removed for criticising Laud in a pamphlet. Henry looks like he might be wearing a ruff. I marks various witnesses, one of whom was Susannah Bastwick, smartly attired in linen kerchief and a coif. Susannah was the wife of John Bastwick who had also lost his ears in the pillory. 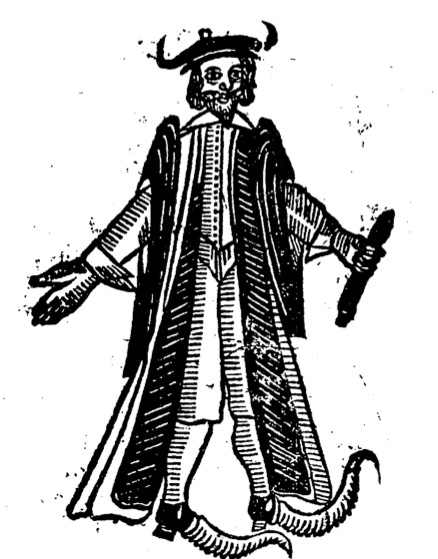 Here is the ghost in a short tabbed doublet and breeches, falling band and an odd kind of bonnet, over which garb he is wearing a lawyer’s gown. He also has high heeled shoes over which have been stuffed what look like ram’s horns, possibly to mark him out as a ghost. Usually ghosts are depicted in their winding sheets. The general Rendezvouz, the Oxford Junto frighted. Waltham house taken by the London Brigade. The Hamlets and the Southwarke Regiment advanced. It’s not obvious however to which story in the text that the image depicts. It is particular to this edition, but doesn’t really correspond to any of the reports. 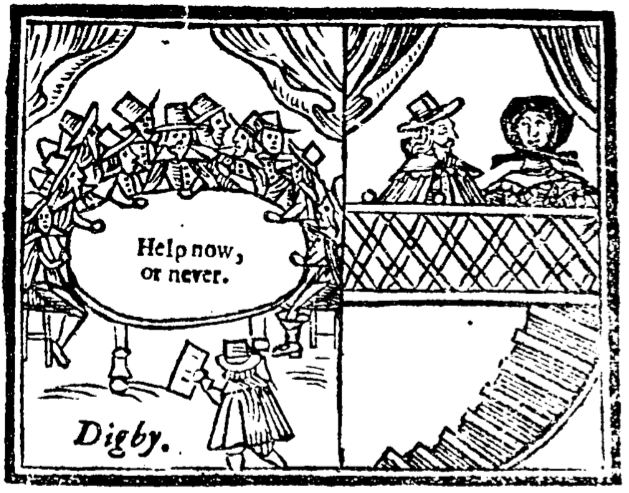 It may be the Oxford Junto story, as there were several Digbys on the Royalist side, but I can’t be sure nor why they were so keen for help. 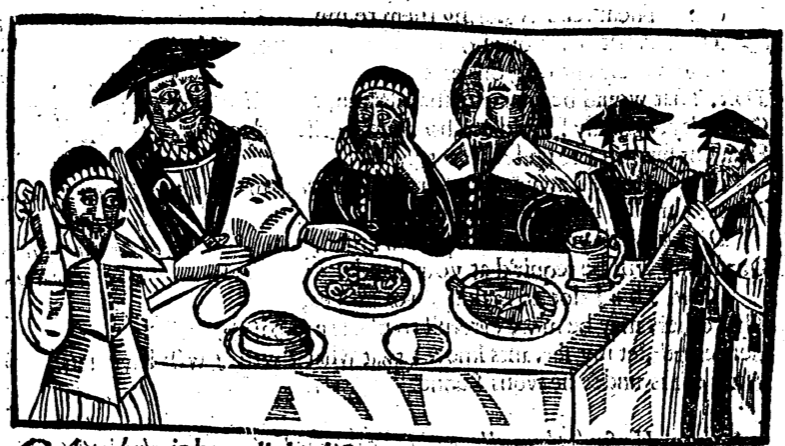 Anyway, it’s a nice image, (though not particularly detailed) of a group of men sat around a table in doublet and breeches with the ubiquitous wide-brimmed hats and those funny little triangles that look like falling bands but which I believe are the linings of their cloaks as they hang back off the shoulders. In the right hand side, there is a gentleman and a lady seated in a balcony. 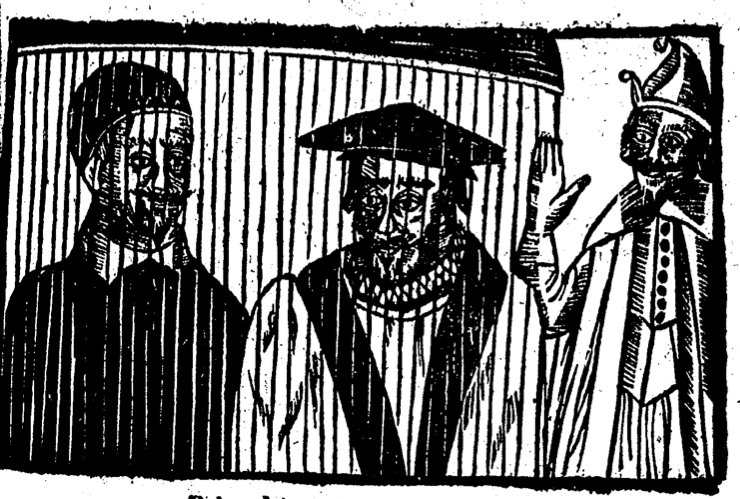 Although it’s a rough woodcut, you can see they are finely dressed and the lady is wearing a black hood or chaperone tied at her throat. Possibly the King and Queen? Who knows? Or a fit admonishment for city and countrey, wherein is described certaine causes of this affliction and visitation of the plague, yeare 1641. which the Lord hath been pleased to inflict upon us, and withall what meanes must be used to the Lord, to gaine his mercy and favor, with an excellent spirituall medicine to be used for the preservative both of body and soule. …let the Patient that is in danger of any infection or any other disease take and use this spiritual medicine, first in the morning when thou arisest out of thy bed, fall down on thy knees, and give God thanks, that he hath preserved thee the night past from all dangers, and desire him of his mercy, to preserve thee the day following, bless his holy name and magnify him, for her is thy maker, and thou art his creature, thus passé away the day in the service of the Lord and at night , when thou list down to sleep, desire the Lord be thy keeper and defender. This is the picture on the front cover. 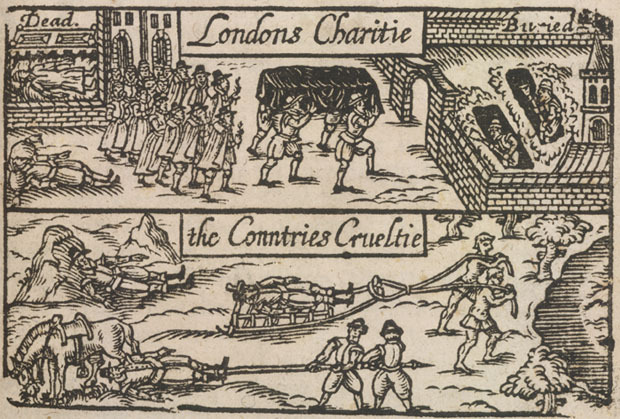 The top image shows how London still honoured the dead, even during the plague; (the one at the top dressed only in his shirt) bodies being carried to the burial grounds in coffins by workmen in short doublets and breeches and followed by mourners, the men in cloaks, the women in waistcoats and petticoat skirts. Graves were still dug by grave diggers (wearing caps). The lower pane shows a more rough and ready method of disposing the dead possibly used outside the city, with the dead being dragged to a communal pit on sleds or just by their boots. Painted by an unknown artist and hanging in the Blake Museum in Bridgwater. 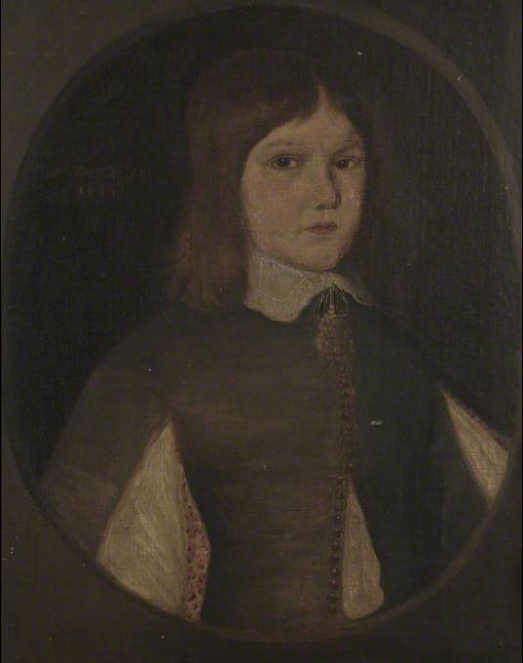 I’ve not been able to find out much about William apart from the dates of his birth and death (1635-1707) which date this portrait to 1649. It’s quite a dark somber picture, but you can see some details here: the tassels on his band strings and the buttons on his doublet, fashionably open to display the linen of his shirt (which is also visible through the slashes on his sleeves). Tricky to spot any more detail, but there may just be a wide band of lace on his falling band and possibly some red-worked embroidery on the lining of his right hand sleeve. Two more plates from John Vicar’s book of 1646. These two sit together on page 25. 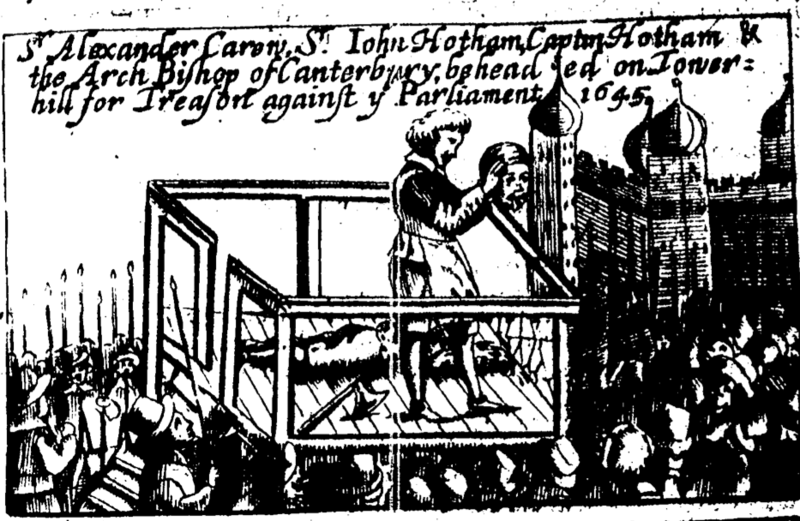 The first image shows the execution of Archbishop Laud on 10th January 1645, though the text also makes reference to Alexander Carew who was beheaded in December 1644 and John Hotham and son (Captaine Hotham) who met their deaths in the same place a few days before Laud. All three were parliamentarians who had fallen out with the leadership. This shows the depth of feeling in 1645; that mere political opponents and the Archbishop of Canterbury were felt worthy of execution. 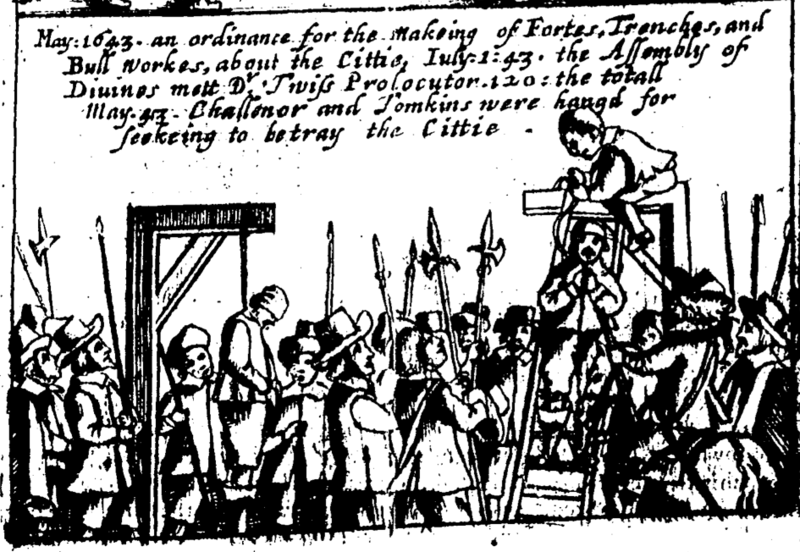 The soldiers standing around the scaffold from what we can see are wearing coats and broad-brimmed hats whilst the executioner is bareheaded and dressed in a short tabbed doublet, breeches and shoes with a neat apron to keep his clothes (relatively) clean. 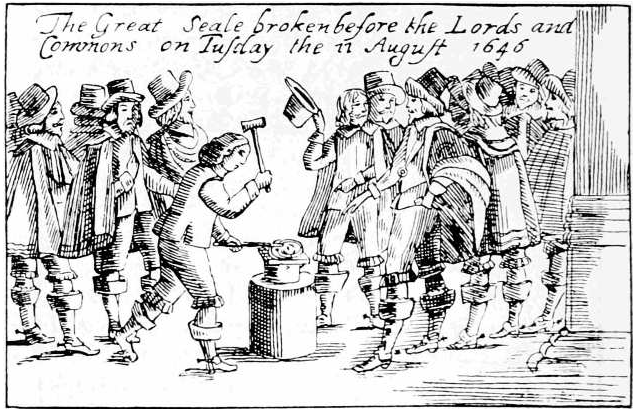 The second image shows the breaking of the great seal in 1646. This was a greatly symbolic act as the King’s seal attached to any bill passed by Parliament signified his approval. 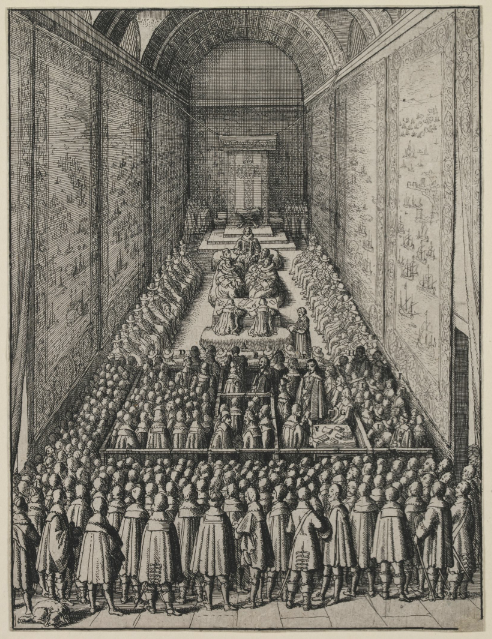 The fact that it was broken in front of the assembled Lords and Commons made it plain that Charles’ presence was no longer required. The onlooking parliamentarians are dressed in doublets and breeches. The breeches are mostly decorated with ribbon bows below the knee. Several are sporting cloaks, even though this is taking place in August, and all have boots rather than shoes. 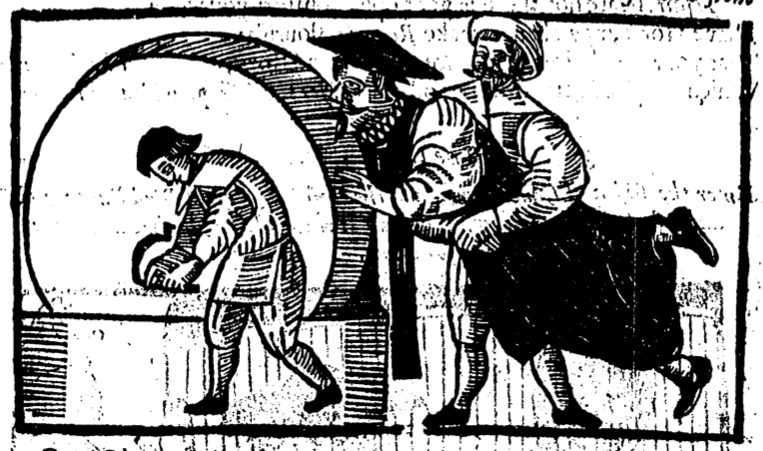 Continuing the images from the book by John Vicars from 1646. 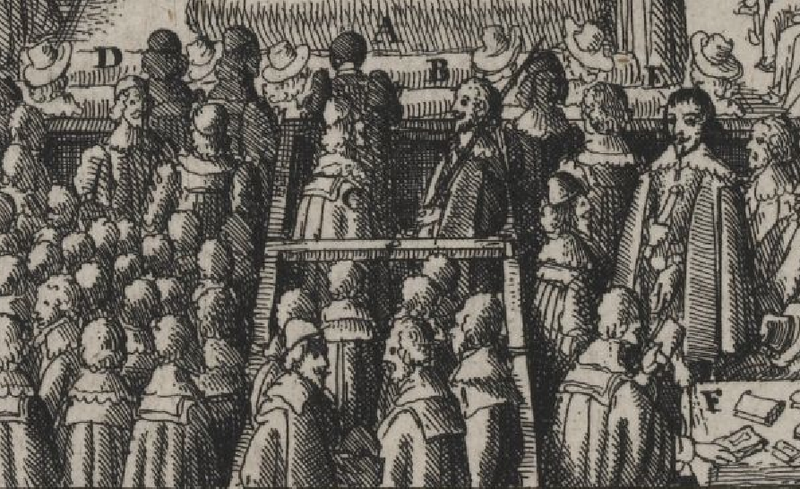 This one shows the execution of Mr Tompkins and Mr Challoner (I can find no christian names for either) who were involved in a plot to let a small royalist army into London to take the city for the King. There is an interesting eye witness account here. The soldiers appear dressed in coats and breeches with broad brimmed hats whilst Tomkins and Challoner are sporting day caps or maybe hoods. Who knows? Emblemized with Ingraven Plates, which men may Read without Spectacles. A short book by John Vicars, published in London in 1646 showing some of the political episodes that had occurred before and during the war. Several of the plates were republished from All The Memorable Wonderstrikings of 1641, but this book from the same publisher, Thomas Jenner added text and (thankfully for us) some more images that take the story on to 1646. 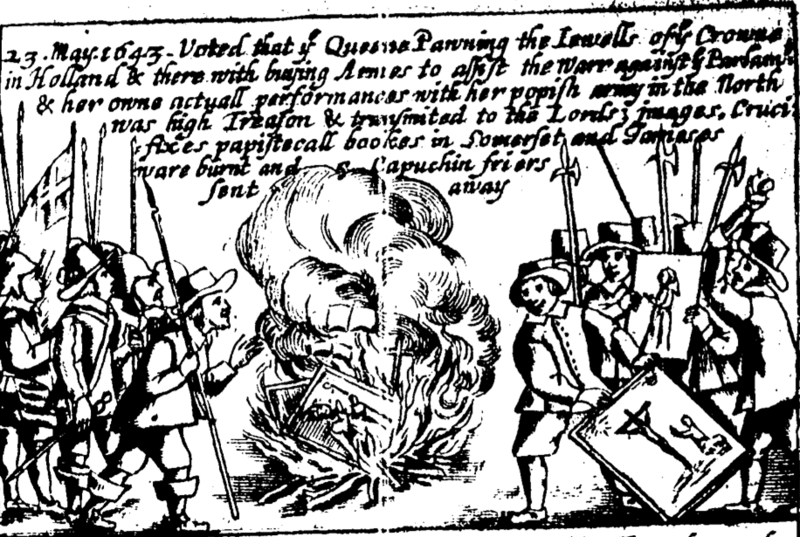 The thrust of the text was solidly on the Parliamentary side and in this first picture we see a group of soldiers (in Somerset according to the text) burning what they considered were papist images and crucifixes. The image shows some decent details of the cut of their coats and breeches. Some nice brimmed hats too, and a couple of troopers on the left hand side seem to be sporting pot helmets, though its tricky to be sure. The officers have long boots and the men shoes. Note each soldier has a small linen band visible over the coat. 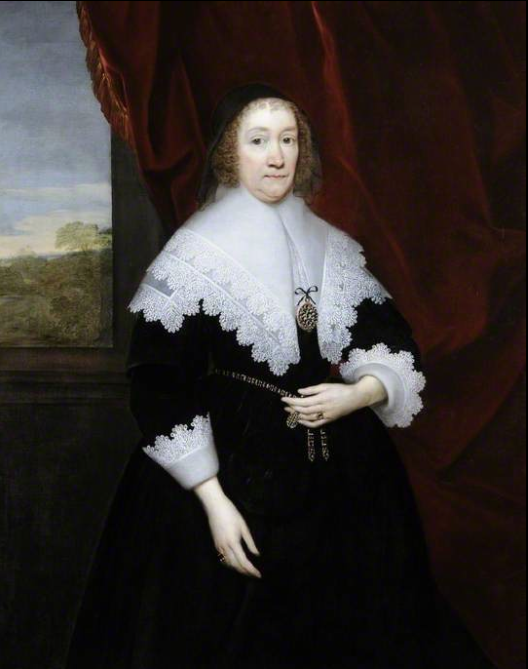 Painted by Cornelius Janssens van Ceulen in the 1630s, Elizabeth was wife to Sir Thomas, first Baron Coventry who was a career lawyer and involved in several high profile legal cases through the years before the wars, though treading a politic central line between the King and parliament, he managed to keep his position for many years. Elizabeth is wearing a black dress, presumably bodice and petticoat skirt, though it is tricky to see any details, a black coif on her head, with a triple-layered kerchief around her neck and matching lace on her cuffs.